So, of course, we’ve gotten very good at answering that question. However, to those that think that matching to a white kitchen is a breeze, we have some startling things for you to consider, lest you accidentally make your white kitchen look a bit more lackluster than you’d initially intended. If you’re installing floor tiles during a kitchen renovation, then you should choose your flooring and cabinet colors very, very carefully – as they’re going to be in your home for longer than just about every other appliance or decoration you own. No pressure, right? 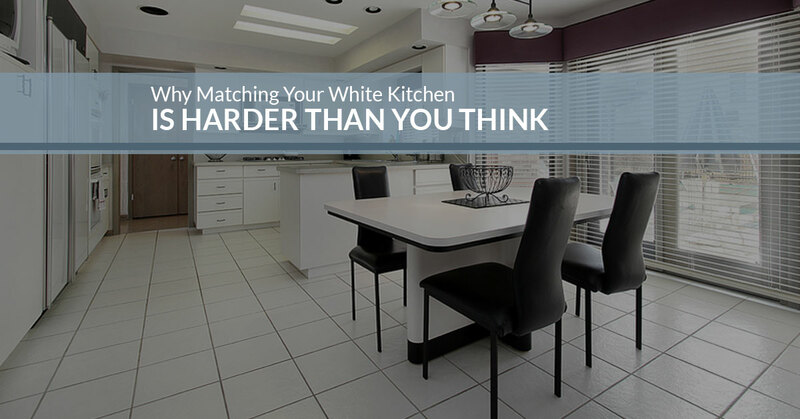 If you want to nail your white kitchen (the first time), then follow our flooring matching steps, which you could even apply to backsplash, fixtures, and even countertops! The first revelation that people do not think of, and should really be warned about, is that white things aren’t all the same white! White is an incredibly tricky color to work with if you’re starting with it. Think of an outfit, for instance: Matching white to just about anything else is almost always an easy, excellent choice, but matching a white garment with another white clothing element is much more difficult; next time you wash your whites, look closely at just how many different white clothes you have – then imagine an entire color wheel feel of slightly different whites. Why does this matter, you ask? Because, one company’s white paint may end up with a very warm and bright finish, while others can come out with a calming, cool finish; put these two together and you have a disaster. So, when you’re matching your floor to a white cabinet, you can’t just say “white,” you need to know which white, what effect it will have on the eye, and what you need to balance out with all subsequent colors. Seriously, if you take nothing else from this blog, please remember this: Whenever possible, bring a sample of your cabinet’s finish (if installing new) or go so far as to remove a cabinet door (if already installed) to compare with every design choice you’ll make for your kitchen. We mean every single decision, too; this should include floor tiles, countertops, backsplash tile, wall paint, and even light fixtures and the bulbs themselves. Whites are that tricky! Confused? Let us explain. Think of your upper cabinets as the top of the sandwich, your backsplash and/or countertops as the first middle, your lower cabinets as the lower middle, and then the flooring as the base, then go down the list from right to left. 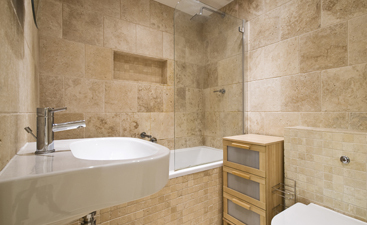 In any case, your “neutral” should always include a calming, complementing color that doesn’t detract or distract from the overall design, which could be your tile choice, grout color, or even the marbling on your countertop. Since your cabinets are white (at least half-white, if you chose to do white only for the uppers or lowers), you inevitably cannot have a neutral at either end of the sandwich. So, what does this mean for your floors? All of this groundwork – pun intended – was laid to set up for the floors: When you have white cabinets, you should always use either warm or cool floors, meaning no neutrals! Stay away from colors in the middle of the spectrum, as well as mild hues, unless they look absolutely fabulous with your cabinet choice. You want to create either a contrast or a complement to your cabinet with your floors, reserving your neutral balancing for backsplash, paint, or countertops (the “meat” of the sandwich, not the “bread”). Choosing a warm or cool floor could mean dark or light, in either case, but typically you’ll find cooler colors in the darker sections – these are your browns, blues, and even most blacks – while warmer colors will be your brighter colors – meaning other whites, yellows, and tans. You’ve undoubtedly seen rich, dark hardwood (or wood-look tile) paired with white cabinets, which is a safe, effective option for most designs; but equally great is a beautiful sandy-colored stone floor tile, as long as it is used with the above warm-cool sandwich layout. 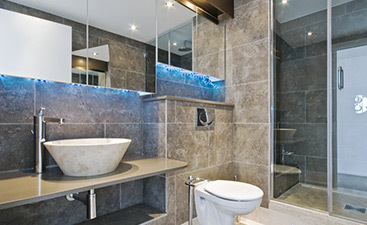 Last, but certainly not least, we’ll give you a few practicality tips for choosing a light or dark floor. If you’re trying to pick all of your design elements around white cabinets, then we’d advise picking out your floor tiles before you even look at countertops or backsplashes. After all, your floors will get used far more than your countertop or backsplash, so it’s probably wise to be the most comfortable with them – you’ll likely stop noticing your countertop and backsplash a few months after you install them, but your floors will be much more evident. Dark floors hide crumbs and other debris a little better – nobody’s perfect, you’ll likely love to have a bit of a “forgiving” floor if you have pets, kids, or walk on your floors regularly; this can also be a con for the neat freaks out there! So, there you have it. That’s our guide on matching your flooring (or other design elements) to your white cabinets. Above all, be sure to take away the importance of being conscious about your exact type of white, then building your selections from there. 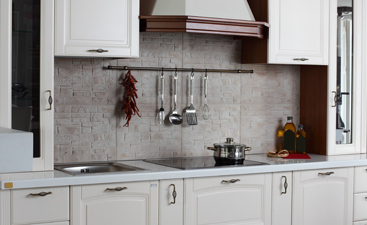 You may look a little silly carrying a cabinet door into your local tile store, but that’s a price worth paying to get a kitchen that looks just as great as you’re hoping.